The Malaghan Institute Cell Technology Suite offers state-of-the-art cell analysis, including - flow cytometry, cell sorting, cryosectioning, immunohistochemistry and immunofluorescence microscopy. It provides crucial services, support and training not only to Malaghan staff, but also to the wider scientific community, especially in regards to new clinical research opportunities. The Cell Technology Suite is proudly sponsored by the Hugh Green Foundation and Frank Millar & Co Ltd, Wellington - Industrial & Commercial Electricians. Download FACS Vantage DiVa configuration. 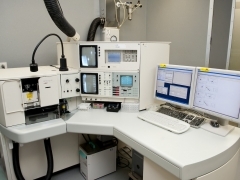 This benchtop analyser is capable of supporting a wide range of basic flow cytometric applications. It is engineered with fixed optical, electronic and fluidic components, giving them the flexibility to function as an investigator-operated instrument. 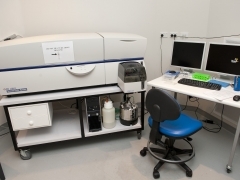 The BD LSR Fortessa is a digital benchtop analyser flow cytometer. It is a four-laser machine that has 15 optical detectors and removable optical filters that can permit the detection of different fluorophores and fluorophore combinations. The LSRII flow cytometer is a digital bench top analyser. It is an 18-colour, 5-laser machine that has optical detectors and removable optical filters that can permit the detection of different fluorophores and fluorophore combinations. The HTS option allows users to rapidly acquire samples from a plate. The HTS supports 96-well plates, as well as 384-well plates. The HTS can process a 96-well plate in ~45 minutes in “Standard” mode (taking 10µl of sample) and ~15 minutes in “High-Throughput” mode (taking 1µl of sample). The FACSVantage DiVa is a high performance, high speed, sterile, cell sorter that can isolate up to 15,000 individual cells per second. Sorted cells are then returned to the researcher so they can continue their study into how this cell of interest may be involved in the particular disease they are studying. The sorter is capable of simultaneously sorting up to four different cell types from a given sample. The FACS Vantage DiVa is equipped with an Automated Cell Deposition Unit (ACDU), which allows for event deposition onto slides, into 96 or 384 wells plates, or other custom collection devices. This unit allows us to sort single cells with over 95 % confidence. The BioPlex 200 is built on xMAP® technology and is remarkably easy to use. It combines two lasers, fluidics, and real-time digital signal processing to distinguish up to 100 different colour-coded bead sets, each representing a different assay. The microplate platform automates the reading of 96-well plates and yields up to 9,600 data points in ~35 minutes. Our BioPlex is also equipped with the High-Throughput Fluidics (HTF) option which delivers up to 20L of sheath fluid (~40 plates) without user intervention. The AutoMACS™ Separator is a benchtop instrument for high-speed automated cell sorting. Employing the MACS® Technology, the autoMACS Separator is designed for positive selection as well as depletion of magnetically labelled cells. The autoMACS Separator is operated with preset separation programs, thus allowing optimisation of cell sorting approaches according to cell abundance and the intensity of marker expression.